Employment data on Friday caused a massive short covering which pushed SPX to close near its all time high. 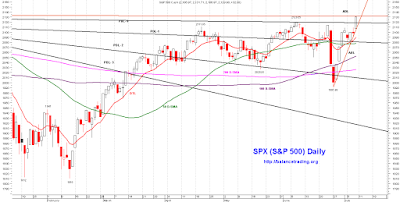 Chances are good that SPX continues its rally after a brief sell off to back test its AUL and PDL-0 around 2120 sometime on Monday or Tuesday. Also on Friday, gold rallied to close at a two year high while 10 year treasury yields dropped to all time lows. Last two times (August of 2000 and January of 2008) that similar rallies in gold and bonds occurred simultaneously were just prior to significant market corrections. 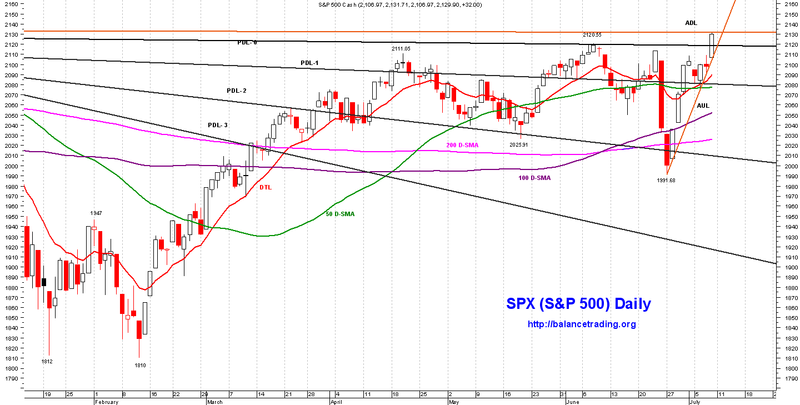 My plan is to close my short positions should SPX rally and put in a new all time closing high.